In these lessons, we will learn how to find the area of a triangle using the sine function when given side-angle-side (SAS). Another formula that can be used to obtain the area of a triangle uses the sine function. It allows us to find the area of a triangle when we know the lengths of two sides and the size of angle between them. Remember that the given angle must be between the two given sides. 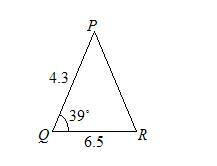 Find the area of triangle PQR if p = 6.5 cm, r = 4.3 cm and ∠ Q = 39˚. Give your answer correct to 2 decimal places. 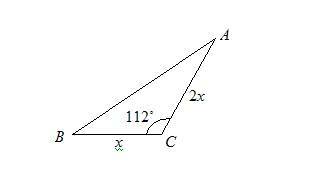 In triangle ABC if AC = 2BC and ∠ C = 112˚. The area of triangle ABC is 16.3 cm Find the length of BC . Give your answer correct to 2 significant figures. This video explains how to determine the area of a triangle using the sine function when given side-angle-side (SAS). b) B = 72°, a = 23.7 ft, b = 35.2 ft. This video provides an example of how to determine the area of a triangle using the sine function. How to use the sine function to find the area of a triangle? This video explains how to find the area of a triangle using Sine.